"Ranch dressing perks up a crowd-pleasing, cheesy crescent appetizer." 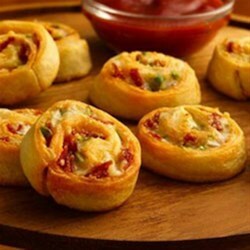 Heat oven to 350 degrees F. If using crescent rolls: Unroll dough; separate into 2 long rectangles. Press each into 12x4-inch rectangle, firmly pressing perforations to seal. If using dough sheet: Unroll dough; cut lengthwise into 2 long rectangles. Press each into 12x4-inch rectangle. Very tasty pretty little treats. The first batch came out dry (2 tbl spoons wasn't enough. The 2nd bath was great I left out the ranch dressing and used cream cheese. Wonderful! What a huge hit at our christmas party!!! Very tasty. I altered the recipe by using cream cheese creamed with ranch dressing.. chopped onion and chopped garlic. Holy cow delicious! Love this idea; I plan to try it with a little Northwest flair by using smoked salmon, capers, and cream cheese!